The aim of this chapter is to demonstrate the advantages of combining methods from different research paradigms. 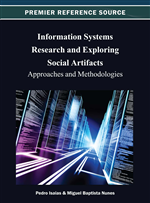 Positivism, interpretivism, and critical social theory are presented as major paradigms in Information Systems research. The chapter demonstrates the use of methods representative of these three research paradigms in a single research setting. The main problem in the research setting is the poor performance of students in a specific module of their academic programme. This problem is addressed by initiating an action research project using methods representing different research paradigms in the different phases of the project. The argument for using mixed methods is presented by providing information on research paradigms, discussing the problem environment, describing the research process, and finally, reflecting on research paradigms and their application in this environment. Brief information on research methodology terminology is provided in order to clarify the position of the research team. Research approaches are then discussed in terms of paradigms. A short discussion on research paradigms, mixed methods, and research quality follows. Quantitative purists believe that the observer should be objective and separate from the entities that are observed. They should remain emotionally detached and uninvolved. This is in accordance to the positivism paradigm described in the following section. Qualitative purists reject this and argue for idealism, humanism, and hermeneutics. They are characterised by a dislike of detached writing and prefer detailed and rich description (Johnson & Onwuegbuzie, 2004). This is in accordance with the interpretive paradigm described in the following section. Quantitative research is used to study natural phenomena and include experiments and numerical methods. It is data based on numbers / values. This is the main type of data generated by experiments and are primarily used by positivists, but can also be used by interpretivists or critical researchers. Qualitative research, on the other hand, uses quantitative data, for example interviews, documents, observations and stories, usually to understand and explain social occurrences. The emphasis is on processes and meaning that cannot always be measured in terms of quantity, amount or frequency. It includes words, images, and sound. In this chapter the term qualitative refer to textual data and quantitative refer to numerical data. The assumptions regarding the validity of data are handled in terms of research paradigms rather than type of data. A short discussion on research paradigms, mixed methods, and research quality follows.